PHOENICIA. Arados. 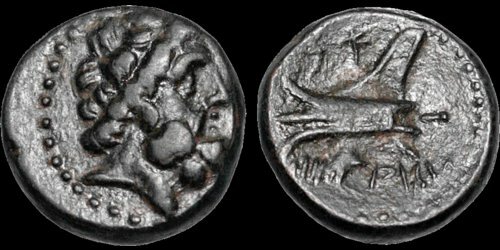 Circa 206/5-52/1 BC. Æ. 3.73 gm. 15 mm. Dated CY 116 (144/3 B.C.). Laureate head of Zeus right / Ship's ram left; Phoenician letters above, date below. Duyrat 1848-9. HGC 10, 88. DCA 767. Extremely Fine; glossy black patina.